Hromada (Geneva) [«Громада»]. 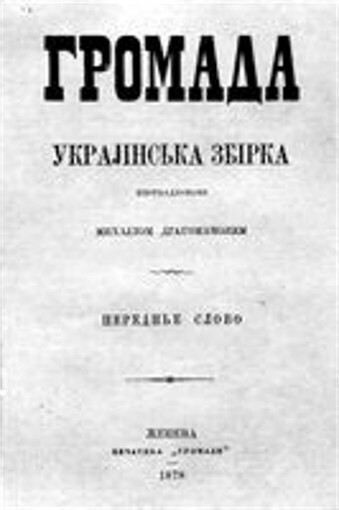 Sociopolitical and literary collection published in Geneva from 1878 to 1882 by Mykhailo Drahomanov with the assistance of Antin Liakhotsky, Serhii Podolynsky, Fedir Vovk, L. Drahomanov, and later Mykhailo Pavlyk. Altogether five volumes of the collection appeared: two in 1878 and one each in 1879, 1880, and 1882. 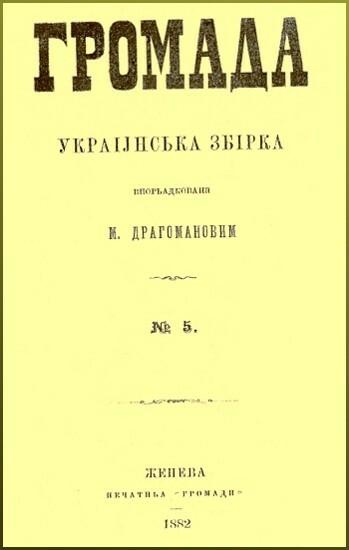 They contained theoretical articles advocating a democratic, socialist program, surveys of socioeconomic conditions in Ukraine, literary works, and critical essays such as M. Drahomanov's important essay on Taras Shevchenko. 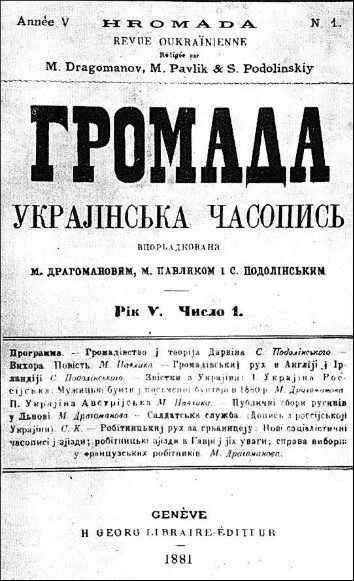 In 1881 two issues of a political journal also entitled Hromada appeared in Geneva. Its editors were Mykhailo Drahomanov, Serhii Podolynsky, and Mykhailo Pavlyk. Its platform, which accepted the necessity of a revolution, was defined more clearly than that of the collection. Besides surveys of political developments in Europe and analyses of socioeconomic conditions in Ukraine, the journal published belles lettres. In 1886 the Hromada of Kyiv, which considered Drahomanov's political commitment untimely and harmful to the Ukrainian national revival in Ukraine, broke off relations with him. Without the hromada's financial support he could no longer publish his collection or journal.